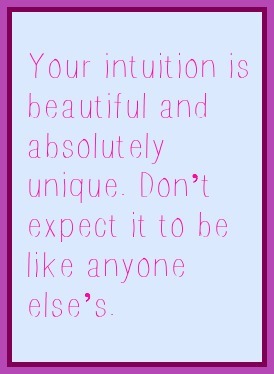 Your Intuitive Style Is Unique. How To Recognize It. Learning about your unique intuitive style will help you both in your work with others and in your own personal life. But that can be easier said than done, especially if you believe that intuitive information should come to you in a particular way -- as words that pop into your ear, for example, or as visual images. If you can free yourself from these limiting notions and accept that intuitive information comes to you in your own natural, unique style, it will help you open the doors to intuitive wisdom. Knowing your particular intuitive style, you can more easily recognize intuitive information when it appears. And this wisdom can help you heal, stay well, grow emotionally and spiritually, and be of help to others. ”just knowing” — receiving information without knowing how it got there — you just know something. environmental — receiving intuitive information from the world around you, such as messages on billboards or the appearance of particular animals. Most of us have natural preferences for one or two of these styles. None is better -- they're all of equal value. 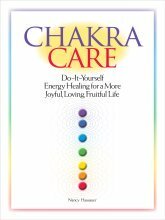 Learn more about using intuition in healing. You may also be interested in "What Is Intuition?" Or go to Energy Healer Basics. Go to Sensing Subtle Energy.